SLR with a 50mm f2. I decided to take on the challenge of shooting film because I had heard the clichés about slowing things down and how this can improve your photography. After a couple of filmic photomissions around the peninsula, I can report that the cliches are all true. There is something about having to fight the plastic sprockets to load your film, having to count your frames as you shoot to make sure you don't run out, and having to calculate your exposures for each shot, which force you to take stock and frame more carefully. You're no longer running around shooting anything that moves and deleting as you go. You're planning shots now. Pre-visualizing. Of course the other element which gives you pause is that you can put a dollar amount to each click of the shutter. Factoring in the costs of film and developing means that there is no such thing as a cheap shot, and this really serves to move you away from the spray-and-pray approach of digital. This isn't 'taking' pictures on the run, this is 'making' pictures. One thing I noticed when getting the shots back was that film is a lot more forgiving. I know I can easily lose detail when shooting digital because of it's small Dynamic Range. For the uninitiated "Dynamic Range" is how much information your sensor or film can hold in the darkest shadows or brightest highlights before they just disappear to pure black or white with no hope of recovery. I have heard it said that digital can only hold one stop of light in either direction from your exposure, where as film can hold up to three stops, which if true is a huge difference. Being a digital shooter I assumed that many of my shots would come back with an unusable amount of detail loss, and I was struggling with not being able to check my shots on a digital screen to see if I was in the ball park, especially when trying to expose for a bright sky or dark foreground which is a guessing game when using the primitive global metering system which just gives the average suggested exposure for the image. So I was pleasantly surprised to get the images back and see that film has an incredible ability to hold detail through a wide tonal range. Hardly any shots were wasted. Take the example of my friend Roger standing in front of the red wall. That is direct sunlight hitting his hair. On my digital that would have completely blown to white, but the film managed to hold all the detail in the dark hair towards the back of his head, and the sunlit hair at the front. The other aspect which frustrated me, but also added a new joy to shooting, was waiting to see the shots. There is something exciting about having no idea what you really have, and having to wait and see. Not having the immediate feedback actually heightened the experience on some level. I'm not about to start shooting pro jobs with film, or become a full time hipster, but shooting film definitely has a charm. So, I'm really enjoying this little side project and want to expand it as I go. So far I have been using fairly inexpensive Fuji Superior 400 film, but I am very keen to try some Ilford black and white film, as well as the expensive colour stuff like the Kodak Portra, which I fell in love with from using VSCO film emulation. 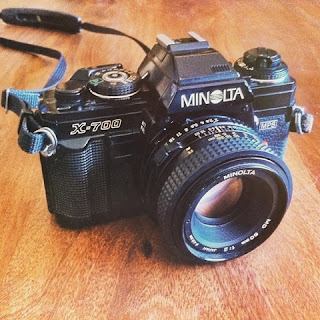 I also really want to get my hands on a Medium Format film camera to experiment with the extra resolution, unique shooting angle, and different aspect ratio. I'm eyeing a Mamiya C330. I'm enjoying the slower pace, as well as the mental exercise it's giving me having to know my settings and dialling everything in manually without an LCD screen for reference. Hopefully regular film exercises will make me a more patient and competent photographer.